Jeffrey Welch's Blog: What Are the Signs of a Truly Hungry Dog? What Are the Signs of a Truly Hungry Dog? When it comes to eating, most dogs are seemingly bottomless pits. Not only are they used to having their meals at regular times, they’re also used to manipulating their owners into giving them snacks and treats between meals. The calories add up over time, and lead to weight gain, digestive problems and a host of other health issues. People have enough trouble making the distinction between need and desire for food, so how can we tell whether we have a hungry dog — or one who’s just bored? The Association for Pet Obesity Prevention‘s 2016 survey of veterinary professionals and pet owners reveals that the portly Pug you see on your daily walk is not an outlier. Indeed, the survey found that over half, or approximately 42 million American dogs, are either overweight or obese. Since dog nutrition needs differ widely by size, age, breed and genetics, it can be difficult for dog owners to determine just how much food is ideal for their canine companions. Are you feeding your dog too much? Too little? 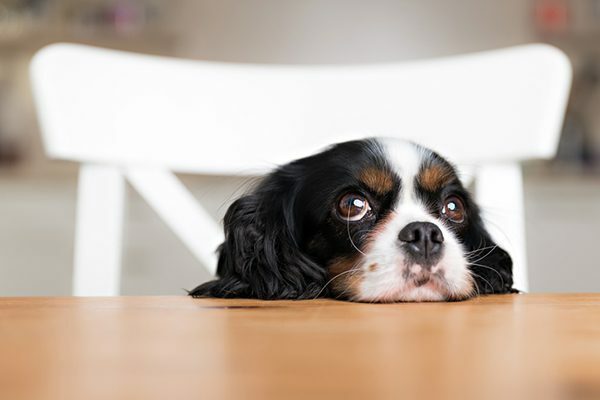 A dog sitting at the table looking hungry — bored? Photography by fotyma/Thinkstock. If your dog feeding schedule has you filling a bowl even once a day, chances are your dog is not, by any definition of the word, “hungry.” According to veterinarian Dr. Lou Budik, as long as they have ready access to fresh water, dogs that are “relatively healthy can go three, four, five days without food, many even longer than that.” A truly hungry dog, at least in a comfortable domestic setting, is a rarity. Puppies: Three small meals per day. Small adult dogs: Two small meals per day. Medium to large adult dogs: Two well-portioned meals per day. Large to giant adult dogs: One well-portioned meal per day. Senior dogs: One to two smaller meals per day. These are sweeping generalizations. There is no universal dog feeding guide calculator. Much depends on the health and activity level of your individual dog — let’s look at those factors next. How much food should your dog eat? Activity level matters! Does your dog sit on the couch so much that he practically has his own indentation in the couch pillow, fitted neatly to his curled-up girth? Daily, or at least regular, exercise plays a part. In many cases, a dog who seems hungry is actually just in need of more physical activity. I try to walk my dog, Baby, every day. Realistically, it works out to about 4-5 times each week. Movement uses energy, and energy expended means a dog needs nutrients to replenish it. Regular exercise affects digestion, too. At Dogster, we think a lot about dog poop. A healthy dog eating wet food can move their bowels within 4 hours after eating. The same amount of dry food might take 8 hours. Each of these times to evacuation are affected by motility, or the operation of the muscles in the digestive tract. A dog that exercises regularly moves and processes the food he eats more efficiently than a sedentary dog. Even weather affects how much a dog should eat! I typically feed Baby twice a day. During the hot summer months in North Carolina, I’ve noticed that a bowl of food I leave for her in the morning is untouched when I get home from work. Summer heat drives dogs to cool resting spots where they do not need or use much energy. My dog’s need for food, her hunger, if you will, is diminished when she is less active. This year, I started feeding her one smaller meal during the dog days of summer, and found that she was better about finishing it. The same principle — energy expended guiding the amount of food you provide — can be applied to any dog, regardless of environmental conditions. I learned, through a lot of wasted dog food over the last three summers, about how my dog’s need for food changes over the course of the year. If there is that much variance in my dog, imagine the task in trying to prescribe to all dog owners how much food their dogs need! Suggested portion sizes on dog food bags and containers are only that, suggestions, and vary by manufacturer. The surest and most foolproof way to determine the individual needs of your dogs, at all times of year and at every stage in their lives, is to consult with your veterinarian. What Exotic Fruits Can Dogs Eat? The post What Are the Signs of a Truly Hungry Dog? appeared first on Dogster.